From the moment you first contact our office, you’ll notice the difference in our team’s caring, individual approach. Our entire dental team is committed to continuing education and clinical development. We know learning doesn’t ever stop — and we’re constantly working on improving our skills to offer the latest in modern dentistry. 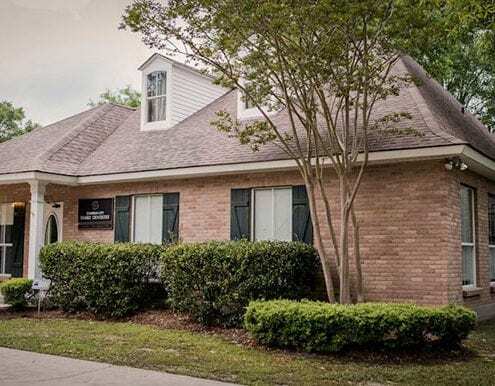 As a third generation family practice, Camellia City Family Dentistry has been a trusted place for dental care in Slidell, Louisiana for over 65 years. The clinic was ounded and operated by Dr. James Tomaszewski, Dr. Steven Tomaszewski‘s father. Upon Dr. T’s retirement from private practice in 2010, Dr. Steve assumed sole operation of Camellia City Family Dentistry. Dr. Steve is a Slidell native and graduate of Northshore High School. He attended LSU, where he studied in a pre-dentistry/microbiology curriculum and graduated with a Bachelor of Science degree. He then was accepted into the LSU School of Dentistry where he earned his Doctorate of Dental Surgery. He has completed an Advanced Education in General Dentistry residency and served around the globe as a dental officer in the U.S. Navy. Dr. Steve quickly gained experience from working closely with mentor dentists and specialists while in the military and also later as he transitioned into private practice. These formative years helped Dr. Steve establish his unique skill set and, under the guidance of his father, Dr. James Tomaszewski, developed his expertise in cosmetic and complex restorative care. Recognizing Dr. Steve’s experience and passion for dentistry, he was also invited to return and teach as a part time faculty member at the LSU School of Dentistry. Pam has been a dental hygienist at CCFD since 1994 and spearheads our efforts to always improve patient care as our Practice Development Leader. She graduated from the University of Louisiana at Monroe with a BS degree in Dental Hygiene in 1993. She is married to her husband, Bobby, and together they spend most of their time cheering on their 4 children in competitive soccer. When she has time to herself, she enjoys jogging, exercising, or shopping. Sue has been a dental assistant at CCFD for more than 15 years and serves as our Clinical Care Leader. She started working in dental care in 1983 and received her CDA certificate from the LSU School of Dentistry in 1985. Sue and her husband Mike have 2 daughters. She enjoys going to the beach and visiting with family. Jennifer has been a member of our team since 1998 and has worn many hats over the years. Today, she is our experienced administrative leader and patient care coordinator. She and her husband, Andre, have 4 children and are devoted baseball fans, spending countless hours supporting their kids at the ballpark. When Jennifer has free time, she spends it by reading or going to the movies. Dawn has been a hygienist with Camellia City Family Dentistry since 2009. She is a graduate of East Tennessee State University and earned her BS in Dental Hygiene in 2001. She and her husband, Brian, are both active in the community and stay busy raising their 2 children. Dawn also enjoys shopping & traveling whenever she can. A Clinical Assistant at CCFD, Taylor received her Dental Assistant Certification in October of 2014 from the Fortis Institute Dental Assistant program in Pensacola, Florida. Taylor is a great asset to the team with her amazing ability to help others feel completely at ease in her presence. These qualities make her a natural when it comes to patient care and service. In her free time, Taylor enjoys visiting her family and friends and soaking up the local culture of New Orleans. A trusted Slidell Practice since 1952! For a "dentist near you" in Slidell, Louisiana and surrounding areas, call us at 985-641-4444! Our dental office is located in the Greater New Orleans Area on the Northshore of Lake Pontchartrain. 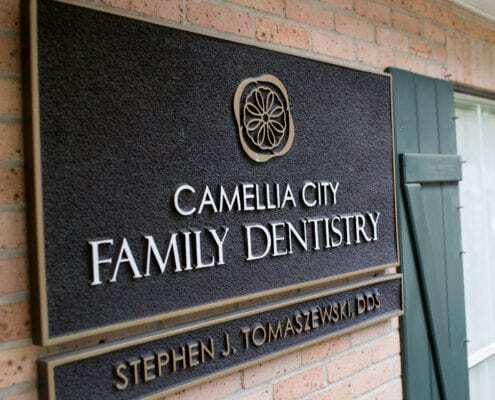 Camellia City Family Dentist Office is located less than 2 miles from the I-10 in Slidell, Louisiana. Slidell is approximately a 30 – 45 minute drive from New Orleans and 15 to 20 minutes from Covington and Mandeville, Louisiana. The town of Pearl River is located just 10 minutes north of our office, while the town of Lacombe is about 10 miles to the west. We also have many clients from Picayune, Kiln, Waveland, Bay St. Louis and many other Mississippi locations. We enjoy clients from many areas along the Mississippi Gulf Coast and the Greater New Orleans area on both the Northshore and Southshore of Lake Pontchartrain. For our potential clients who live in Slidell, Louisiana, we are just off of Gause Blvd. and only 1/4 of a mile from Front Street. We are just behind Chase Bank and about 1/10 of a mile from Slidell High School. From Slidell locals to out-of-town guests, patients who live elsewhere but work locally, and current patients to new, everyone is welcome at Camellia City Family Dentistry! Our patients are like our family – we strive to make every visitor comfortable and help them achieve their best smile through exceptional treatment.